Later this year it's rumored we'll see a new version of the Apple Watch, and a new report suggests the next-gen device will come with an edge-to-edge display for the very first time. 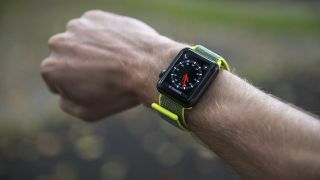 A new report from Mark Gurman at Bloomberg (who is usually accurate with Apple leaks) suggests the company is readying two new versions of the wearable for this year. Both variants of the Apple Watch 4 will apparently come with edge-to-edge, larger displays compared to the Apple Watch 3. The report suggests you'll be able to keep using your existing Apple Watch bands with the next-gen wearable too, suggesting the watch will stick to the 38mm and 42mm sizes. Considering Apple's move to lose the bezel on the iPhone X, it makes sense the company would like to limit the amount of screen space wasted on the Apple Watch as well. This also comes after we heard a report from the Ming-Chi Kuo, a trusted analyst on Apple topics, who said there would be a redesign for the Apple Watch very soon to allow for 15% more screen. This move to offer a larger display will be the biggest design change for the wearable line since it launched. So far, Apple has opted to tweak internal elements and bring new features to the watch rather than overhauling the entire design of the wearable. There's no clear sign of the Apple Watch losing its square design with rounded corners and we also haven't heard whether the device would be lighter or thinner. So you should expect a similar look to the Apple Watch 3 but with a larger screen at its center. Next week is Apple's WWDC conference when we expect to hear word of the new features coming in watchOS 5, so be sure to keep an eye out for a few hints on the Apple Watch 4 features then. We currently expect Apple to announce the Apple Watch 4 in September alongside the rumored iPhone X2, but nothing is for certain and that could easily change.